Officially, the North Carolina Executive Roundtable is defined as a 'collaborative' group comprised of highly-experienced executives and professionals from private industry, non-profit organizations, government agencies, and military service who have served in senior c-suite and p-level positions. I call it a think tank and I am one of its founding members. I had the privilege of working with these fine men and women to draft the group’s mission and vision statements. Members come from a broad array of industry sectors, professions and functional areas. They bring in-depth knowledge and subject matter expertise to the table, enabling them to assist and advise one another and others who seek their counsel on a breadth of issues currently affecting their business or in which they wish to increase their knowledge and understanding. While membership in the NC Executive Roundtable is selective, the group welcomes and encourages inquiries and interest from anyone who feels they can benefit from the kinds of expertise represented within the group, or who may bring particular subject matter expertise they wish to share. The group is also pleased to provide its breadth of expertise to small business owners and entrepreneurs. The group recently visited with Abel Zalcberg, CEO of OFM Inc. in Holly Springs, NC. Established in 1995, OFM is one of the nation’s leading manufacturers, distributors and wholesalers of office furniture for business, government, schools, hospitals, and churches. It employs 29 full-time employees and has operations in Phoenix, AZ and Taiwan. The company sells just about everything needed to furnish an office out of its 124,000 sq. 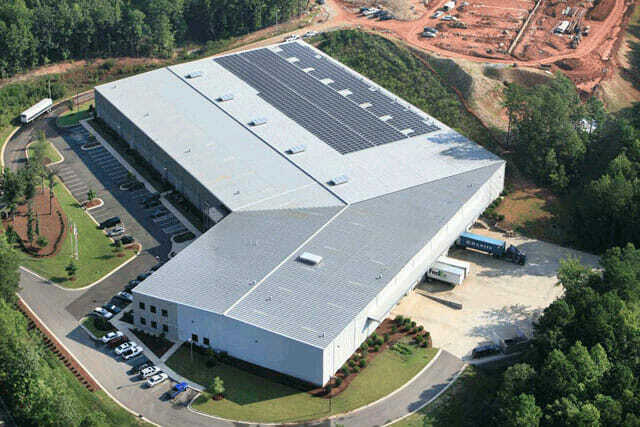 ft. office and warehouse in Holly Springs. It is currently planning a 15,000 to 16,000 sq. ft. expansion to allow faster shipping of low-volume products, such as chairs in non-standard colors. So why would a group of 20+ executives be compelled to visit OFM? Because Abel Zalcberg is a pioneer in going green with solar energy. He recently finished implementing a 250-kilowatt solar farm on the roof of his Holly Springs warehouse. The solar panels take up just a fourth of the warehouse roof, yet this midsize solar farm generates more electricity than Zalcberg needs to run his business. The excess energy is purchased by Progress Energy and sent into the grid. Zalcberg spent $1.4 million to build the solar farm, but more than half that cost is covered by state and federal incentives. The federal government reimbursed him $400,000 right from the start which covers 30% of the cost of the project. North Carolina will reimburse OFM for about 35% of the cost in the form of state tax credits over seven years. Additional tax benefits such as accelerated depreciation are estimated to lower the company’s tax obligation by as much as $170,000 over the next two years. Progress Energy buys electricity from the solar farm at 18 cents per kilowatt hour. So instead of paying for power, the net effect is that Progress Energy will be paying Zalcberg an estimated $60,000 per year over the life of their 20-year contract. The solar farm is clearly a profit center and well worth the investment considering Zalcberg will earn as much as $2.2 million in direct payments, tax breaks and incentives. How much power does the solar farm generate? Very much power! But let’s be realistic. The sun shines a lot in North Carolina, but it doesn’t shine all the time. Solar energy is dependent on sunny weather. When the sun is out, a 250-kilowatt solar farm produces enough electricity to power about 150 homes at peak output. But when the sun doesn’t shine, that number drops to about 50 homes. Solar energy is here to stay. Green technologies are here to stay. In fact, they are the future for powering America. As a group of pioneering visionaries like Zalcberg, the NC Executive Roundtable is on the bleeding edge of thought leadership around these emerging technologies and other innovations. We welcome all inquiries.